It’s Breast Cancer Awareness Month! 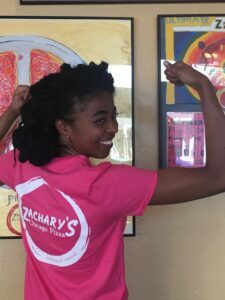 For the entire month of October, Zachary’s will be selling pink t-shirts! We started selling pink t-shirts in 2014 after a group of Zachary’s employee owners participated in the American Cancer Society’s “Making Strides Against Breast Cancer” walk in San Francisco. The walk was inspirational, a great place to learn and LOTS of fun. Since 2014, we have continued the tradition of raising money for the American Cancer Society with our pink t-shirt sales. This year, t-shirts will be sold from our Oakland location on College Avenue and our Pleasant Hill location. All proceeds go directly to the American Cancer Society!